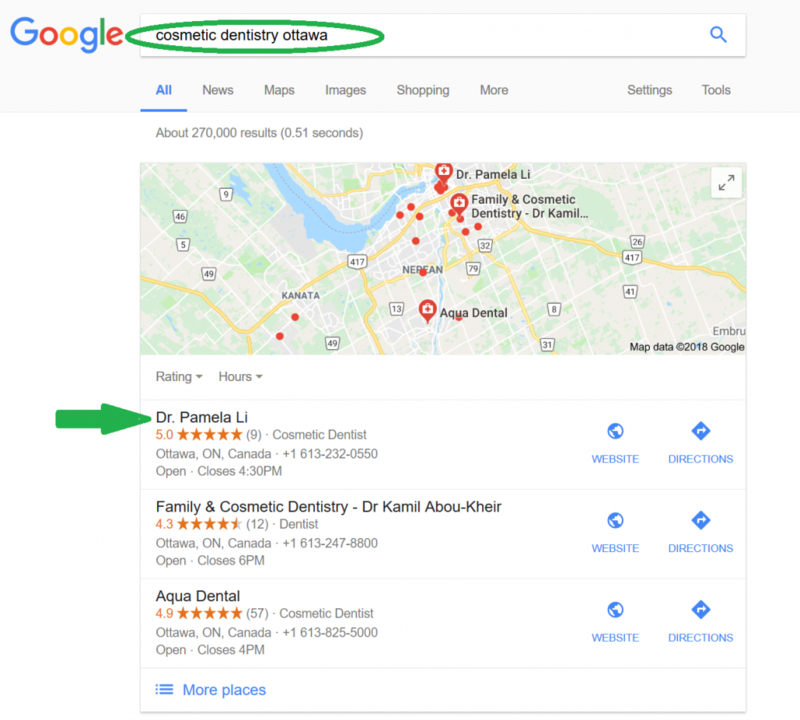 Three years ago, Millionairium Dental SEO constructed a new website for Downtown Ottawa dentist Dr. Pamela Li. Dr. Li recently achieved the most growth out of all other Millionairium clients. Dr. Li’s website experienced a 180% increase in new visitors in January of 2018! In the past year and a half, Dr. Li’s website has achieved 509% more new visitors compared to the previous 18 months. The office is busier than ever, and more new patients are scheduling appointments thanks to Millionairium SEO. “Only Millionairium has given me the steady and consistent results I needed to build my business. I have a busy practice today, and I attribute a lot of our success to Ali and Millionairium,” Dr. Li said. Three years ago, Millionairium design team constructed a new website for Dr. Pamela Li. Like some of our other clients, Dr. Li has been through her share of SEO companies. One of them was a local guy, but all of them failed to deliver results. The first amazing milestone that deserves mention is that Dr. Li has become one of Millionairium’s best-performing clients this year. 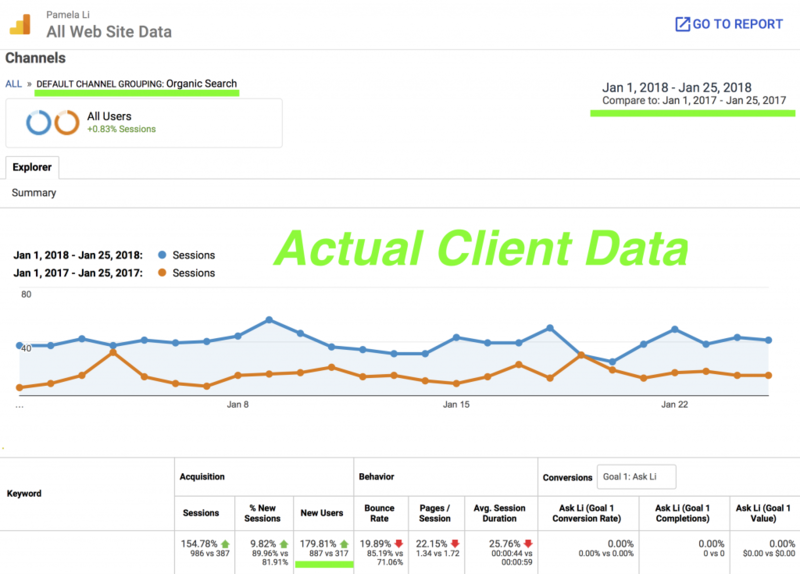 Her website attracted 180% more organic traffic (mainly from Google) in January of 2018 when compared to the previous year, and overall organic traffic grew 180% over a two-year period (see below). All that traffic didn’t come out of nowhere. Each number represents a person who was drawn to the links in Google thanks to our efforts. The links these visitors chose consisted of well-optimized blog posts and web pages that were optimized for Google. Each contains keywords that, when people search for them, help Dr. Li’s website appear at the top of the search results. Google SEO has helped Dr. Li achieve the top spot for many important keyword terms, such as “cosmetic dentistry Ottawa,” where patients are more likely to seek out those profitable cases like implants and full smile makeovers. Dr. Li’s results are impressive, but it has not been an easy ride. Her story is unique and should be a lesson to other dentists, cosmetic surgeons, orthodontists, lawyers and other small business owners who want these kinds of results. It’s all about being patient with the right SEO company, even when things look bleak. That’s how you make a massive impact in the search rankings, as Dr. Li has found, which is currently driving an influx of loyal new patients to her dental office, keeping the dentist and staff very busy. Dr. Li opened her dental office in the late nineties. By the mid-2000s, Dr. Li noticed that the competition was beginning to form an online presence. She sensed a major trend shift in the way dental practices should be marketed, and began to seek the help she needed. As Dr. Li began searching for help, she noticed that marketing companies in the states were much more focused on the web. Dr. Li worked with a few companies and even hired a local guy at one point, but everyone kept giving her lackluster results. There’s a saying that goes, “You only get out what you put in.” By hiring these sub-par SEO companies and local SEOs, Dr. Li was damaging her online reputation. It wasn’t her fault. Google SEO has been a mystery even to most SEO experts. Still, the damage was done. A few years ago, Dr. Li’s website was so penalized by Google for excessive and questionable backlinks and other Black Hat SEO violations, that we decided to start completely from scratch. We had a choice, to start from scratch by investing thousands of dollars in a new site or by trying to fix Google’s penalization of the old site. Dr. Li chose the former. 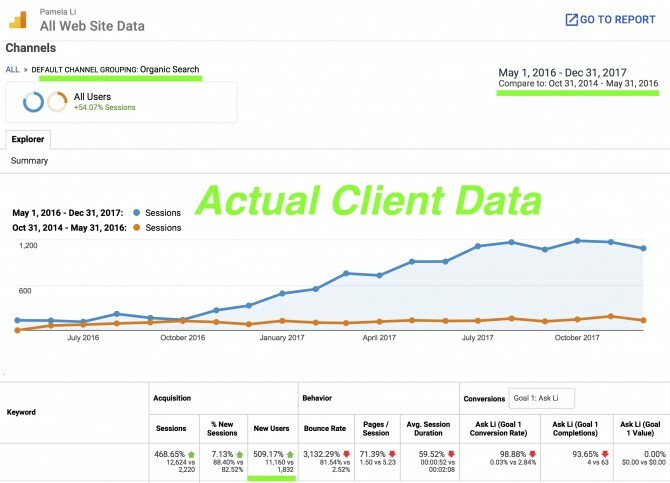 We created a new website for her that infused clean (white-hat) SEO from the start, and the results above are the result of that difficult decision. “When Ali and Millionairium made me a new website, I was skeptical. I’d worked with a few other companies prior, and none could give me the results they promised. Ali was different. This new website is responsive and easy to navigate, and the website is being found by new patients,” Dr. Li said. That was a few years ago. Today, Dr. Li is killing it in her local Ottawa, Ontario. Would you like results like Dr. Li? What if I told you that we could help you dominate your local area in Google, and that you wouldn’t have to pay anything until you see results? This new program is called Pay-Per-Lead (PPP) and it’s the new, affordable (and exciting) SEO program we have for dental professionals. Remember, we don’t just help dentists get to the top of Google. We also help lawyers, plastic surgeons, and other small business owners. Contact us at 3102992799 or email us. © 2018 Millionairium. Authorization to post is granted, with the stipulation that Millionairium is credited as sole source. Linking to other sites from this document is strictly prohibited, with the exception of herein imbedded links.